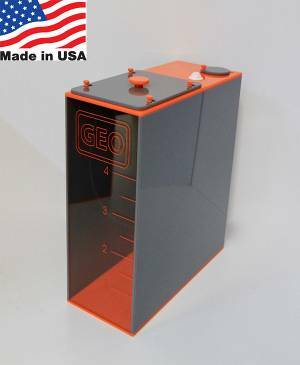 The GEO ATO Reservoirs are designed to match the GEO R Series Sump line in both color and width x height dimensions. Each GEO ATO Reservoir comes with GEO logo and gallon measurement on the clear face panel. An abundance of special features come with these ATO Reservoirs such as four thumb screw large opening lid, quick connect bulkhead with plumbing for ATO pump, and swivel door for power cords. For an additional cost of $25.00 you can add a GEO Universal Float/Optical Sensor holder to your ATO Reservoirs. This holder is mounted on the back right wall and is adjustable so that you can monitor the water level in your reservoir and set high and low limits with your ATO equipment. These holders will fit Neptune Systems Optical Sensors and most hexagonal floats. Sensors and floats are not provided.